First impression when opening the box and the case was that this is a beautiful instrument. Nicer than expected and hard to believe that one could get such a nice instrument for so little money. 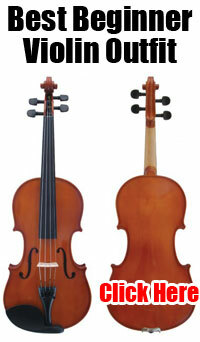 After checking the instrument and tuning it I rosined one of the bows included in the case and began to play. I was very impressed with the first sounds coming out of such a green (brand new) instrument. I couldn’t put the viola down until I had played for at least one hour. In the short time that I played the viola began to open (became louder and easier to play) in sound. The next day I turned on the video camera and made my review posted above. It has a great sound despite its age and complete lack of being played on. The look is one of a handmade instrument that costs many times more. Large enough case to store a lot of accessories. Well working pegs and fine tuners. Steel core strings hinder richer sound and make it difficult to play in-tune. Two bows with little hair and brittle as well (broke off at least 10 in an hour). Badly fitted soundpost (will have a luthier refit to hear the difference). The cons for me are not as important as the pros in this case. The accessories are easy to change but I wish that Cecilio would only include one high quality bow instead of the two included. Secondly, extremely few consumers will be able to set or fit a soundpost correctly. I would suggest that the time given to the makers who fit the soundposts be lengthened and that they are inspected more diligently. Lastly, I feel that the steel core strings should be traded for high quality perlon core strings for an instant improvement. To summarize my review I would gladly recommend this viola to both beginner violists and more advanced players looking to upgrade.